Whether your shaft needs straightening or replacing Watson Marine performs all shaft work onsite with the ability to machine up to a 4” diameter. 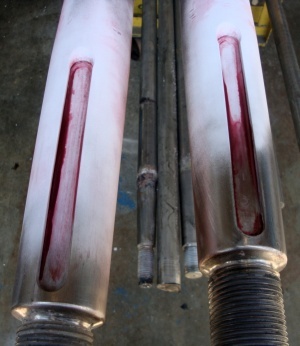 Watson Marine has the equipment to straighten what may seem an unsalvageable shaft to within 0.001”. New shafts can be manufactured in a variety of sizes ranging from 1” to 4”, using either 316, 2205 or Aquamett 22 grade stainless. 2205 Stainless Steel is held in stock to ensure a quick turnaround for replacement shafts and is one of the finest materials available for pleasure boat shafts. Its composition gives it an outstanding combination of strength and corrosion resistance. Shafts may be manufactured with either a double or single taper. Double tapered shafts are designed to be reversible. This effectively doubles the life of the shaft as it can be turned end for end if wearing occurs. Single tapered shafts are designed to be used with a clamp type shaft coupling.We also fit and supply couplings and machine keyways. A vessel operating under a Survey Class requires the shafts, couplings and rudders etc to be pulled approximately every 4 years & assessed by a certified Marine Surveyor. Watson Marine has the facility to perform all of the work onsite. We can remove the stern gear from the vessel and transport it back to our workshop. We then liaise with the selected Marine Surveyor, perform any necessary checks to get the gear signed off & have it refitted back into the vessel as quickly as possible. We understand commercial vessels are quite often running to a tight slipping schedule so where feasible we always try to prioritize our workload around commercial operating vessels for the quickest possible turnaround. Tapered couplings can be machined in our workshop from K1045 steel, stainless steel or aluminum bronze. 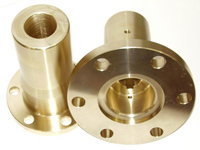 They are made to order and can be manufactured to fit the output flange of any gearbox. Precision machined, they provide the best fit possible between coupling and shaft. Watson Marine re-faces couplings, cotton reels & spigots which are not running true to the gearbox. This process is also commonly done post run aground to allow minimal room for vibration upon re launch. This step is quick & inexpensive but very crucial for accurate stern gear maintenance. 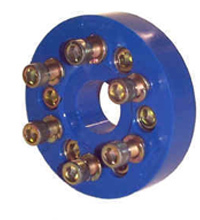 The flexible series couplings consist of a contoured flexible disc moulded in, tough yet resilient, polyurethane. 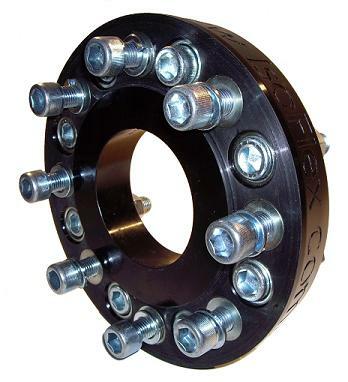 The contoured disc gives clearance for the bolt heads, and is able to flex freely to take up any temporary misalignment of the engine and shaft due to flexing of the boat structure or the engine moving. R & D, Isoflex & Polyflex models available. Watson Marine manufactures skegs in manganese bronze or nickel aluminum bronze. The skegs are hand finished to ensure smooth aerofoil sections which are essential for good water flow into the propeller.Custom skegs can be fabricated in stainless steel to suit customer requirements.The design of the skeg can be crucial to the performance of a power cruiser. Optimum shape should be achieved to ensure no unnecessary drag is created.Watson Marine can fabricate skegs to suit a range of vessels from a typical production sailing cruiser to a twin screw power cruiser. Skegs can be of either a standard platform type which bolts directly onto the hull of the vessel or a glass in type which is fibreglassed through the hull of the vessel. 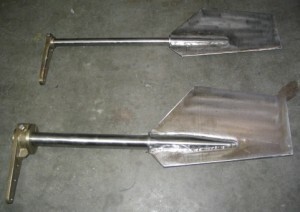 Both of these styles of skegs are supplied with water lubricated cutlass bearings to enhance water flow onto the propeller. 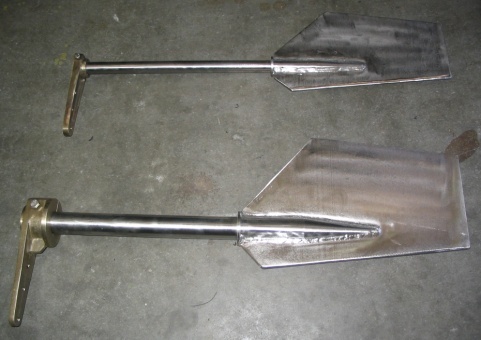 The bronze rudder tube assembly is the most popular of rudder configurations. It is designed for through hull installations. 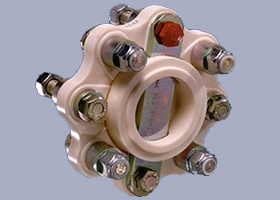 The flange of the tube is bolted to the hull and the top is supported by a transverse floor. Alternatively, the fibreglass rudder tube assembly is ideal for use on fiberglass vessels as the tube can be fibreglassed into the boat to become an integral part of the vessel. Acetal rudder bearings are machined and fitted to either end of the fiberglass tube making up the top & bottom rudder bearings. Watson Marine has the facility to fabricate a wide range of rudders to suit both pleasure and commercial vessels. 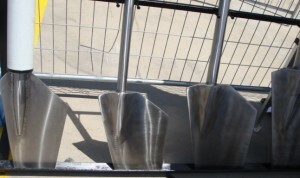 Our rudders are commonly fabricated using 316 SS plate & 2205 SS bar. 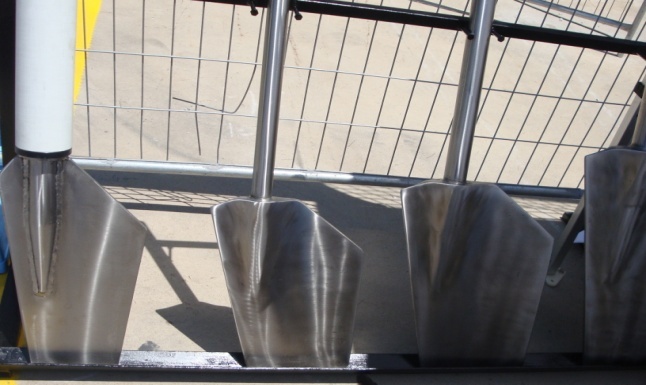 Rudder blades can vary in shape & size from flat blades on displacement vessels to wedge shape blades on high speed vessels & we can custom build to any specifications. 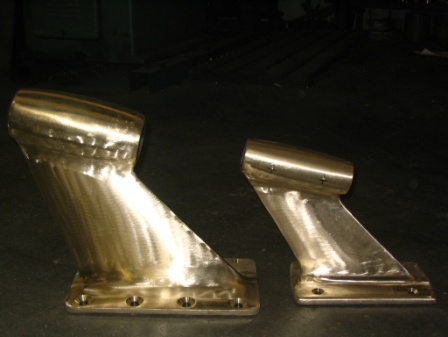 Some common rudder designs we manufacture include the plate, wedge, or foil rudder. We also keep a large range of cast bronze tillers in stock.